The eighties was the first decade of hi-fi as we know it today – things that are recognizably modern now began to be so in the eighties, and this holds for loudspeakers more than any other audio separates. Back in those heady days of Duran and the Golf GTi, hi-fi downsized – thanks in no small part to the changing dimensions of the modern British abode. As property prices soared, new build houses got smaller and the number of ‘Yuppie flats’ exploded. This saw a gradual shift from the sort of speakers we’d seen in the seventies – with wide front baffles and myriad drive units – to small, minimalist two-way stand mourners purposed to work in more compact environments. From this change in living patterns came two iconic mini monitors. Wharf dale’s little Diamond arrived first in 1984, and set the template for baby boxes making great sound. 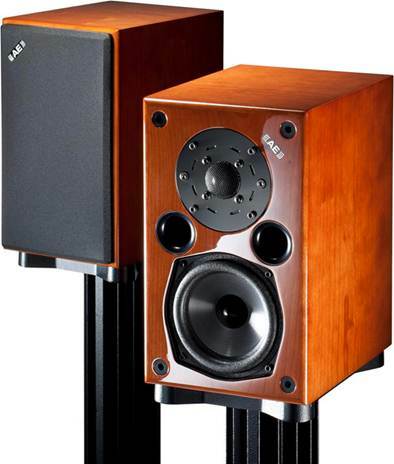 But while they sounded good on the end of a Rega and a NAD, higher-end systems were denied a great small speaker until the arrival of the Acoustic Energy AE1 in 1987. At the height of the eighties boom, when red brace wearing, Porsche 911 driving city traders captured the zeitgeist, came this great symbol of hi-fi modernity. It sounded superb, and stood for a brave new hi-fi world. While a handful of brilliant speakers came out of ‘the decade that fashion forgot’, the vast majority were the exact opposite. They were often three or four-way away, and most used rudimentary paper-coned midrange and bass units, and relatively crude paper or fabric dome tweeters. Polypropylene was thought an exotic cone material back then and that’s only because it was Bextrene, which these days has been consigned to the great speaker skip in the sky. As well as archaic drivers, seventies speakers generally sported what would today be seen as appallingly loose, resonant cabinets. Thin chipboard was often the norm, usually not damped terribly well and only thinly veneered with the obligatory teak wood! This was further aggravated by wide front baffles, which did little for stereo imaging. Round the back, cheapo spring clip connectors were standard. The result was a woolly, ponderous and diffuse sound with low levels of transparency or insight. Imagine then, how the arrival of the new Acoustic Energy AE1 must have felt? From this brand new English company came a strikingly small (295x180x255mm) miniature monitor loudspeaker that broke every rule in the book. 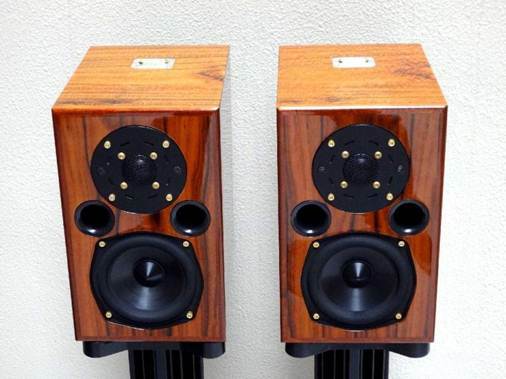 Into the heavily damped and thick 22mm MDF-walled cabinets – finished in the de rigger eighties crackle black – went a 25mm SEAS magnesium alloy dome tweeter. In the eighties, metal domes were cutting edge, the sound of the future, and there was no way the AE1 could not have one! Then, below 3 kHz, an Acoustic Energy-designed and built 90mm ceramic sandwich aluminum alloy cone mid/bass driver took over. The straight-sided cone was spun from aluminum alloy with a graded thickness across its profile and then hard-anodized black on both sides. The straight-sided cone was spun from aluminum alloy with a graded thickness across its profile and then hard-anodized black on both sides. As the anodized layers take up one third of the cone’s thickness, it was effectively a sandwich of alumina (aluminum oxide) and aluminum, said to be both stiffer and better damped than a pure metal. The cone shaped dust cap was glued to the cone, which was driven by a 1.5in aluminum voice-coil former. The mid/bass driver was reflex loaded by two front-firing 40mm ports, and fed by a crossover mounted on the rear terminal panel – contrary to the fashion of the day it was quite a complex third-order affair with high quality iron-dust-cored inductors and low-loss polyester capacitors. This all made for a quintessentially eighties mini monitor – one with a pretty smooth frequency response from 70Hz to 22kHz (+/-3dB) and a high power handling of 200W. But the AE1 was also an effort to drive, with a quoted sensitivity of 86dB/1W/1m, necessitating the use of a powerful transistor amplifier – tube amp owners need not apply! Not that this was an issue in the eighties, as everyone thought thermionic valves had gone the way of the dinosaur. So this was the very epitome of the modern reference monitor – it’s hard to understate how bang up to date it looked in those distant days of 1987.